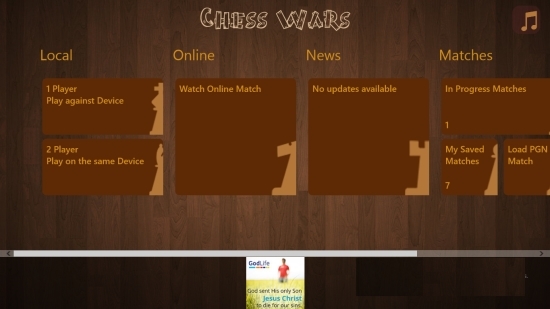 Chess Wars is a free Windows 8 Chess Game app for playing chess on your Windows 8 PC. You can play against your system, or can also play against any other player. There is also an option to watch any game that might be played by other users online. You can also save your game at any point, and restart it from the same point later. The game has 6 different kinds of chess boards to choose from, and has 6 different kinds of Chess pieces available to play. But only some of the game boards and chess piece types are available freely. The game also uses a good background music. Chess Wars is freely available in the Games category of the Windows Store. As you get to the game app, an animation will start showing a game. On the right side of the app’s interface, there is an option to play the game. Click on it, and the options that are available for you for playing the game will be shown. At this screen, the left most and the one below it will give you the option to play, that is, against the system or against some other player (playing on the same system). For this, Chess pieces and Chess board options are available if you go to the Settings charm of the game. The only limitation here is that only two types of Chess boards and Chess pieces are freely available. For the others you have to pay a nominal cost. Get to the gameplay option, and you can change the Settings of the game, like changing your name, your chess piece color, the time after which the system plays its moves, and other things. 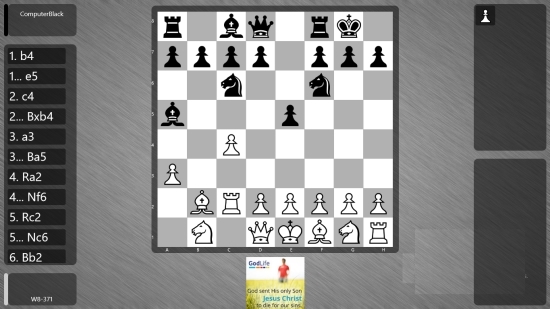 After all these things, you can start playing this free Windows 8 Chess game. You can right click anywhere while a game is in progress, to save the game at that point. Entire progress will be saved. You can get to the Saved Games option available on the menu at anytime to start these games from the saved points. The Watch Online option is also available on the menu screen of the app. As you get to this option, you would be shown all the games that are currently being played by others anywhere around the world (as the game is online). You can click on any one of the game to see it. This option is especially useful because you can watch these games and can learn from them to improve your chess playing skills. You can save any of these games also, and can later try to play it yourself. The saved game would be available in Saved Games section on the menu screen. Also check LearnChess4All and Brick Breaker. The game is freely available in the Windows Store. You can watch someone else’s game and can learn. There are many different chess boards and chess pieces available to play the game. You can save any game, and can later load it from the same point. 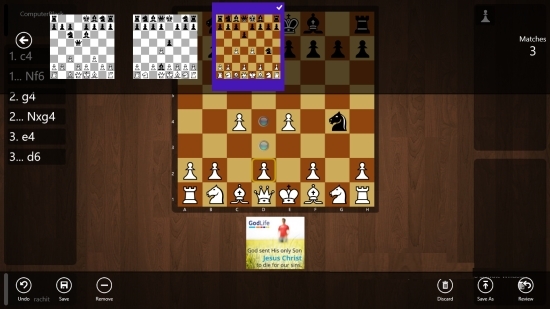 Chess Wars is a nice Windows 8 Chess Game App. I would really recommend playing it.